For the gossamer-winged butterfly genus, see Arhopala § Systematics. Panchala (Sanskrit: पञ्चाल, Pañcāla) was an ancient kingdom of northern India, located in the Ganges-Yamuna Doab of the upper Gangetic plain. During Late Vedic times (c. 900-500 BCE), it was one of the most powerful states of the Indian subcontinent, closely allied with the Kuru Kingdom. 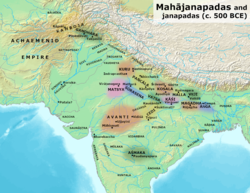 By the c. 5th century BCE, it had become an oligarchic confederacy, considered as one of the solasa (sixteen) mahajanapadas (major states) of the Indian subcontinent. After being absorbed into the Mauryan Empire (322-185 BCE), Panchala regained its independence until it was annexed by the Gupta Empire in the 4th century CE. Panchala and other kingdoms in the Late Vedic period. Panchala and other Mahajanapadas in the Post Vedic period. The Panchalas occupied the country to the east of the Kurus, between the upper Himalayas and the river Ganges. It roughly corresponded to modern Budaun, Farrukhabad and the adjoining districts of Uttar Pradesh. The country was divided into Uttara-Panchala and Dakshina-Panchala. The northern Panchala had its capital at Ahichatra, (also known as Adhichhatra and Chhatravati, near present-day Ramnagar village in Aonla tehsil of Bareilly district), while southern Panchala had it capital at Kampilya or Kampil in Farrukhabad district. The famous city of Kanyakubja or Kannauj was situated in the kingdom of Panchala. The Panchala janapada is believed to have been formed by multiple janas (tribes). The Shatapatha Brahmana suggests that Panchala was the later name of the Krivi tribe (who, according to Rigveda, lived on the bank of the Indus river). The later Vedic literature uses the term Panchala to describe the close associates of the Kurus. The Mahabharata sometimes mentions the Saranjayas as a tribe or a family among the Panchalas, sometimes uses the two terms as synonyms, although it also mentions the two separately at some places. The Mahabharata further mentions that the Panchala country was divided into two territories: the northern Panchala with its capital at Ahichchhatra, and the southern Panchala with its capital at Kampilya. According to the political scientist Sudama Misra, the name of the Panchala janapada suggests that it was a fusion of five (pancha) janas (tribes). H. C. Ray Chaudhuri theorized that these five clans were the Krivis, the Turvashas, the Keshins, the Srinjayas, and the Somakas. Each of these clans is known to be associated with one or more princes mentioned in the Vedic texts - the Krivis with Kravya Panchala, the Turvashas with Sona Satrasaha, the Keshins with Keshin Dalavya, the Srinjayas with Sahadeva Sarnjaya, and the Somakas with Somaka Sahadevya. The names of the last two clans, the Somakas and the Srinjayas, are also mentioned in the Mahabharata and the Puranas. King Drupada, whose daughter Draupadi was married into the Pandavas, belonged to the Somaka clan. However, the Mahabharata and the Puranas consider the ruling clan of the northern Panchala as an offshoot of the Bharata clan and Divodasa, Sudas, Srinjaya, Somaka, and Drupada (also called Yajnasena) were the most notable rulers of this clan. The Panchala kingdom rose to its highest prominence in the aftermath of the decline and defeat of the Kuru Kingdom by the non-Vedic Salva tribe. The king of Panchala, Keśin Dālbhya (approximately between 900 and 750 BCE), was the nephew of the Kuru king, who had died heirless; Keśin subsequently took over the leadership, establishing his kingdom as the new political and cultural center, and ensuring the continuation of the Vedic tradition. His dynasty remained in power for many generations; one of his later successors was the philosopher-king Pravahana Jaivali, who was the contemporary of King Janaka of Videha and the philosophers Uddalaka Aruni and Svetaketu (8th–7th centuries BCE). Coin of Agnimitra, showing the depiction of Agni with flaming hair on the obverse, and a reverse showing the three dynastic symbols of the Panchala rulers and a legend naming the king: Agimitasa. A bronze currency of ½ karshapana of King Indramitra (ca 75-50 BC?) Of Ahichatra of Panchala. Obv: A inside a rectangle, a line of 3 symbols, under the name of the king. Rev: Indra standing on a pedestal without pillars. Dimensions: 15 mm. Weight: 4.18 g.
Coin of Achyuta, the last Panchala king, showing an 8-spoked wheel and the king's name: Achyu. Originally a monarchical clan, the Panchalas appear to have switched to republican corporation around 500 BCE. The Buddhist text Anguttara Nikaya mentions Panchala as one of the sixteen mahajanapadas of the c. 6th century BCE. The 4th century BCE Arthashastra also attests the Panchalas as following the Rajashabdopajivin (king consul) constitution. Panchala was annexed into the Magadha empire during the reign of Mahapadma Nanda in the mid-4th century BCE. Numismatic evidence reveals the existence of independent rulers of Panchala during the post-Mauryan period. Most of the coins issued by them are found at Ahichatra and adjoining areas. All the coins are round, made of a copper alloy and have a set pattern on the obverse-a deeply incised square punch consisting of a row of three symbols and the ruler's name placed in a single line below them. The reverse bears depictions of the deities or sometimes of their attributes, whose names form a component of the issuers' names (for example, coins of Agnimitra bear the depiction of Agni). The names of the rulers found on these coins are Vangapala, Yajnapala, Damagupta, Rudragupta, Jayagupta, Suryamitra, Phalgunimitra, Bhanumitra, Bhumimitra, Dhruvamitra, Agnimitra, Indramitra, Vishnumitra, Jayamitra, Prajapatimitra, Varunamitra, Anamitra, Bhadraghosha and Yugasena (the reverse of the coins of Varunamitra, Yugasena and Anamitra do not exhibit any deity). Shaunakayaniputra Vangapala, ruler of Ahichatra, whom Vaidehiputra Ashadhasena mentioned as his grandfather in his Pabhosa inscription, is identified with king Vangapala, known from his coins. The name of Damagupta is also found on a clay sealing. The last independent ruler of Ahichatra was probably Achyuta, who was defeated by Samudragupta, after which Panchala was annexed into the Gupta Empire. The coins of Achyuta found from Ahichatra have a wheel of eight spokes on the reverse and the legend Achyu on the obverse. ^ D. C. Sircar 1985, p. 1. ^ Sudama Misra 1973, p. 14. ^ Oroon K. Ghosh (1976). The Changing Indian Civilization: A Perspective on India. Minerva. ISBN 978-0-88386-502-6. ^ Raychaudhuri, H.C. (1972) Political History of Ancient India, Calcutta: University of Calcutta, pp.65-8.